Designer toys are one of my prime interests at the moment. I've always loved art, but it's never been especially practical to collect for both reasons of cost and space. This still young plastic artform allows designers and artists to express themselves on a mass market, often mass produced canvas. Even Disney produces its own series under the name Vinylmation, which I recently started writing about for the website VinylmationWorld.com. 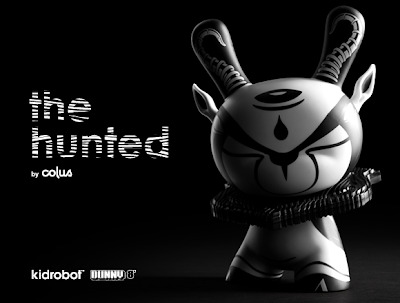 Dunnys are one of the original American designer toys, and they often release limited edition figures in larger sizes. The piece above is called "The Hunted," and is a limited edition release of 1250. Designed by South African born artist Colus, it's inspired by the springbok, an antelope with a striking black and white face. Available on April 11th, this 8 inch vinyl Dunny will retail for $75, unfortunately a bit out of my price range. I'm disappointed I won't be able to acquire this piece, as I love art that represents the animal kingdom. "The Hunted" manages to express the beauty and mystery, even a little bit of menace, of the antelope. A wooden plaque placed around the figure's neck gives a literal bent to the hunted name, and expresses the fragile nature of these creatures in the wild. In reality, springbok are almost comical in how they bounce across the savannah, but this design remains magnificent regardless.